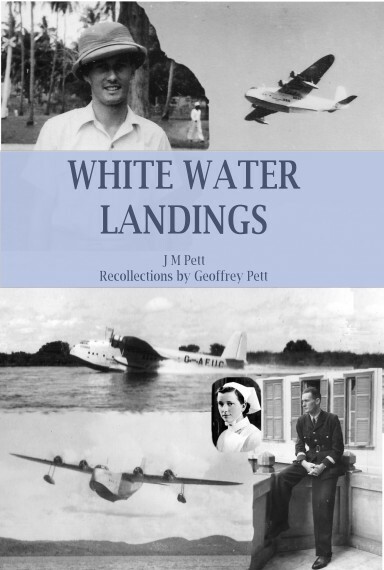 White Water Landings by J M Pett with Geoffrey Pett is due for publication on 11th May 2015. The paperback (ISBN/EAN13 1508700389 / 9781508700388) is available in our Createspace shop now, and is already listed on Amazon.com. Pre-publication price is $14.95 or £9.99. The hardcover book (ISBN:9781320766913) should be publicly available from the beginning of May. It is now available to order from your favourite store using the ISBN shown. The retail price is £30 or thereabouts. You may order it from the preview window but you will receive the proof copy (two typos and a formatting change) with an incorrect ISBN number, although it is at a discounted price. This offer may be withdrawn without prior warning. That time of history captured recorded must have been amazing. Looks like an wonderful memoir. What an adventure!